A pair of firefighting robots are ready for action. 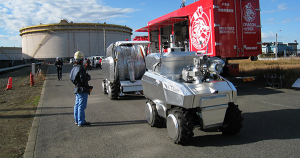 Mitsubishi Heavy Industries (MHI) recently demonstrated at Tokyo’s National Research Institute of Fire and Disaster a pair of autonomous wheeled robots designed to battle particularly hazardous fires, such as those at petrochemical plants — and without putting the lives of human firefighters at risk. Once on the scene, MHI’s Water Cannon Robot and Hose Extension Robot use a combination of GPS and laser sensors to drive themselves to a designated location near the fire. The Hose bot then drives to a fire engine or other water source, laying out a heavy duty firehose extension connected to the Cannon bot along the way. After the hose is connected to the water source, the Water Cannon Robot douses the flames with water or foam — extinguishing the fire without putting any human firefighters in harm’s way. MHI designed the newly demoed robots to function within a Firefighting Robot System that also features a recon and surveillance robot and a command system. The entire system can fit within a dedicated transport vehicle capable of ferrying the equipment wherever it’s needed. According to New Atlas, MHI has yet to announce whether the system will actually be put to use, but based on the demo video, it’s easy to see the potential benefits of having the autonomous bots help human firefighters battle dangerous blazes.